Trump will travel to London for gathering in December, it has been announced. 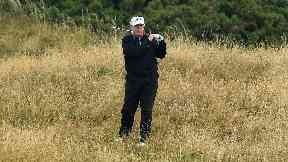 It is not yet known if the President will spend time at either of his golf courses in Scotland. He spent the weekend at Trump Turnberry in the summer after meeting the Prime Minister and Queen. Protests included a Greenpeace paraglider swooping over the resort as the President stood outside.